Embroidery has been embraced by young and old in recent years, with a resurgence in traditional hand embroidery and incredible creations made using an embroidery machine. Embroidery’s a great way to personalize a gift for a baby shower or wedding. You can create a case for your mobile phone or tablet. You can even make a designer quilt or put a logo on little-league caps and shirts. The possibilities are endless. 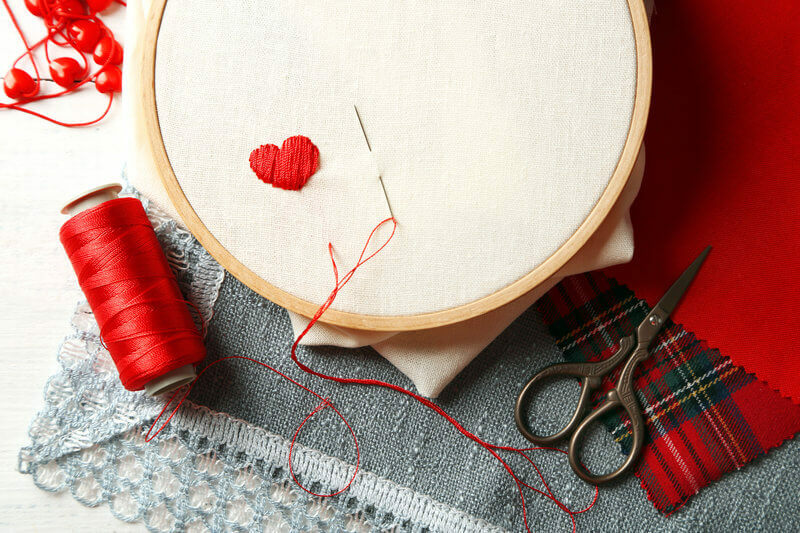 Whether you are just starting out, or only thinking about taking up embroidery, you need to know where to begin. Even those who have used a sewing machine before will find an embroidery machine different. In this article we’ll give you some details about embroidery machines, and some tips on how to get started using them. There are many machines on the market which can embroider. Some are dedicated for that sole purpose, while others double as a sewing machine as well. They vary greatly in cost, from as little as $300 right up to $15,000 and more. You can choose to purchase additional software programs to add more designs to those which are included with your machine. If you only plan to embroider, then an embroidery-only machine will suit your needs. However, if you plan to sew as well, then a sewing machine with an embroidery option will suit you better. It’s worth noting a machine which can do both will likely cost more (and a jack-of-all-trades is a master of none). 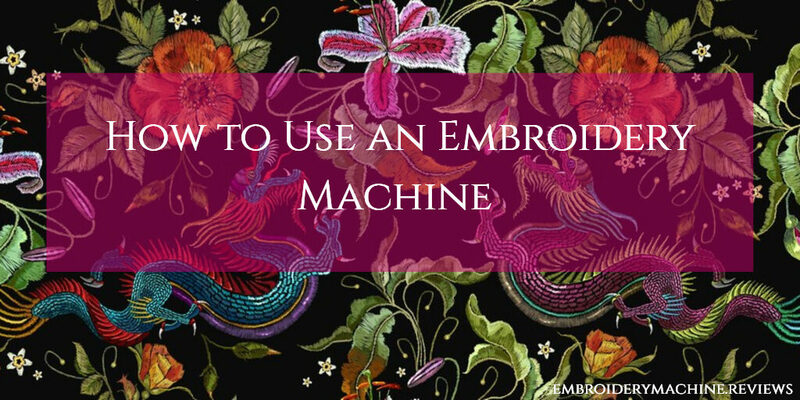 There are a few other terms and items you need to know about when using a machine for embroidery. These include hoops, stabilizers, and design capability. Embroidery machines are generally supplied with hoops which attach to the machine. The purpose of the hoop is to hold the fabric stable and taut while the machine embroiders a design. If your fabric moves while the machine is doing its work, the design will not turn out as it should. You can think of a hoop as being the presser foot of your machine, keeping your fabric stable while it sews. A stabilizer is something used to stiffen or protect your fabric during the stitching process. Working in conjunction with the hoop, it helps to hold the fabric in place. There are different types of stabilizers available to use, depending on your fabric. Some will be seated below the fabric and others on top. Some can be cut or torn away once your design is complete. Others will dissolve in water or disintegrate under the heat of an iron. As a guide, cut-away stabilizers will support knitted items, loosely woven material or any fabric which stretches. The stabilizer remains in place after the embroidery is complete, giving it support. 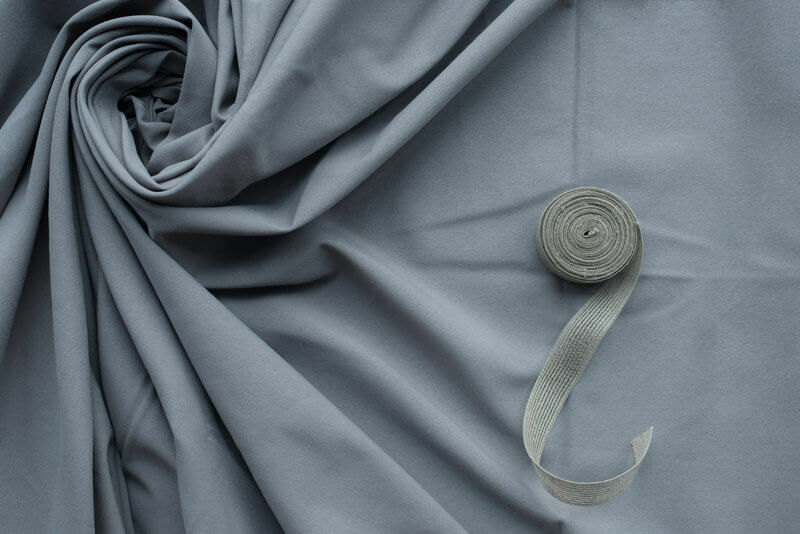 Tear-away stabilizers will support woven materials such as cottons, poplin, chambray and satins. Wash-away stabilizers are perfect for delicate sheer fabrics, such as organza and chiffon. Heat-away stabilizers are good for fabrics which are delicate and can’t be washed. Some machines come with designs already built into an internal memory. However, if you want access to more, it’s a good idea to make sure your machine has that capability. You will generally find such machines can connect to an external computer via a USB port. Some will have a slot for a memory stick or SD card. Some machines will also have digitizing programs so you can customize your own designs. Check whether the software is compatible with the machine you have, or the one you choose. You have your nice and shiny, new machine—but where do you start? I know it’s stating the obvious but carefully unpack it, and any accessories which come with it. I dare say you are also itching to get stitching. However, you really should familiarize yourself with the machine first. Take some time to read the instructions and get to know the parts of the machine and what they do. If you have a combination embroidery and sewing machine, you will need to set it up for embroidery. Do this before you plug the machine in. Firstly, change the presser foot for a darning or freehand embroidery foot. If you want to, you can use this to embroider freehand. However, just starting out, you might be better off using a built-in computerized design. The next step will be to plug your machine in, and connect your computer if your machine requires it. You may also need to install software on your computer. This will usually come with your machine in the form of a disk. Next you need to make sure you are using the right needle. Embroidery needles help to prevent the thread from breaking while sewing. You can use any thread, but those designed for embroidery have a sheen which will make your design stand out. Designated embroidery threads will give your finished product a more professional appearance. Now it’s time to thread the yarn into the machine. Follow the steps in your instruction manual to make sure you get this right. If you have threaded a sewing machine needle before then this should be relatively easy. Take special care to make sure the thread goes through all the loops it’s meant to. If you don’t, your machine might beep with a warning and refuse to work. You also need to thread a bobbin, which sits under the cover and below the needle. Load your bobbin with thread and pop it in place. You might need to consult your instructions again if you don’t know how to do this. There may be an instruction decal at the side of the bobbin case on the machine, showing you how to insert and thread it. Once it’s in, leave the thread hanging loose and replace the cover. The needle will pick the thread up and pull it through. 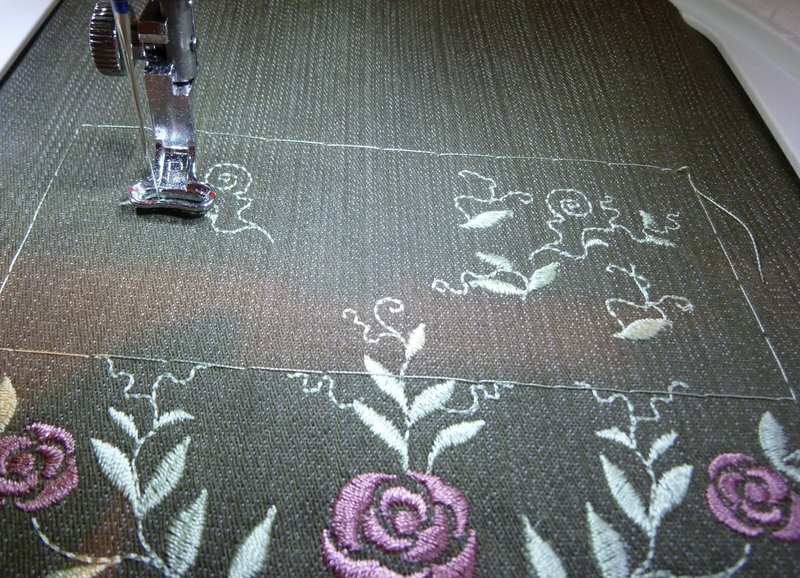 The machine uses thread from the top and the bobbin when it embroiders. To set the threads correctly, you need to pick up the bobbin thread. Use the wheel on the side of your machine to lower and raise the needle only once. The bobbin thread will come up in a loop. Use something small, such as tweezers or small scissors, to pull the thread through. Take the thread and drape it towards the rear of the machine. Make sure your top thread feeds through the sewing foot, and drape that to the back with the bobbin thread. In order to embroider your design, you need to set up a hoop or embroidery frame. This will hold the fabric securely in place while the machine stitches. Your machine might come with different hoop sizes. Make sure you select one large enough for the design you want to stitch. If your hoop is too small for the design, it won’t stitch properly. It might be advisable to practice on some scrap material. That way, you will be happy you know what you are doing before you get going on the real thing. You will need to use a stabilizer to support your fabric while it’s being stitched. These can be purchased online or at sewing and fabric supply stores. There are many different types and brands to choose from. When cutting your stabilizer, make sure it is slightly larger than the hoop size. Make sure you hoop the fabric and stabilizer together. To do this, place them over the bottom part of the frame. Then put the top part of the frame over the fabric and lock or click it into place. Now turn the knob or dial on your hoop to tighten it and secure the fabric and stabilizer. Ensure both of them are taut and don’t have any slack. Be careful when you do this, not to stretch the material. You can pull gently at the sides of the hoop to take up any slack. Slide the hoop into place on the embroidery arm of your machine. Check that you don’t have any fabric caught underneath the hoop. Finally, it’s time for the fun part—stitching your embroidery design. You can choose one that is preloaded in the machine, or—if your machine allows—import one of your own. Press the start button and watch your machine create your design. Remember to keep an eye out for any warnings or messages on the display. Starting out, you might be better off selecting a design with just one thread color. As you become better acquainted with embroidering, you can choose more intricate designs. If you are using different color threads, your machine will stop each time the thread needs to be changed. The embroidery sequence will be displayed on the machine’s LCD screen. It will tell you which thread is needed next. Change the thread by lifting the presser foot and threading it. Hit the start button and the machine will continue embroidering. You will repeat these steps until all the colors are used, and the design is complete. Remove your hoop and release the fabric. Snip off any loose threads. Remove your stabilizer and admire your handiwork. Starting out on a new craft can be daunting, it’s natural to feel a bit nervous. Remember to relax and enjoy what you’re doing. Chances are you won’t get it right first time, but practice will have you turning out masterpieces in no time. Don’t be afraid to seek out some help and guidance. Check to see whether there are any classes or sewing groups in your area. They will be able to help and advise you on all things embroidery, including hooping, stabilizing and design. Don’t jump straight in at the deep end. Start out small with an easy design and then progress slowly. You will soon build up your technique and get to know what works, and what doesn’t. Keep an embroidery diary. All you need is a notebook to jot down the details of your projects. Make notes about which stabilizer you used with which fabrics. Note down thread types and colors and any adjustments you made to your machine. Doing this will help you identify what you can replicate in the future, or what you might need to improve. Keep yourself organized. Knowing where everything is when you need it, will make life easier. We aren’t all lucky enough to have a dedicated sewing room in the home. However, a few spare shelves in a cupboard near where you use your embroidery machine could work. This means you have everything nearby and ready to go. Not every embroidery machine will reproduce a design in the same way. It can turn out differently, depending on a number of factors. These include the fabric, stabilizer, thread and needle, as well as the machine’s digitizer. It is possible that a design file might become corrupted when imported to the machine. Consequently, it’s a good idea to do a test-stitch design first on a similar piece of scrap fabric. This will ensure you get it right on the actual item you want to embroider. Finally, there may be the temptation to go out and buy lots of materials and accessories you don’t actually need. You only need your machine, hoop, thread, fabric, stabilizer, scissors and design to get started. Once you have completed a few projects, you will be confident to decide what extras you need next time. We have outlined the basics to get you started with an embroidery machine. We have also explained some of the items you need, and given you some useful tips. The takeaway from all this is practice, practice and then practice some more. Remember to read the instructions for your particular machine before you get started. Familiarize yourself with the components and materials you need. Even for those of you experienced in using sewing machines, embroidering is a whole new ball game. Get comfortable with each step needed to produce a perfectly embroidered design. In no time you will have beautifully-monogrammed towels and individual designs on your clothes. You will be creating personalized gifts for friends and family. Once you master what your embroidery machine can do, you will fall in love with the results.